Back by popular demand! This is the sequel to my “Choose your own adventure zombie escape game”. This activity does NOT require that you complete part 1. This activity can be implemented as a stand-alone resource. That said, I highly recommend you start with part 1. It will be much more fun for the students. Part 1 is their escape from the school. Part 2 here is about saving the town from zombies. 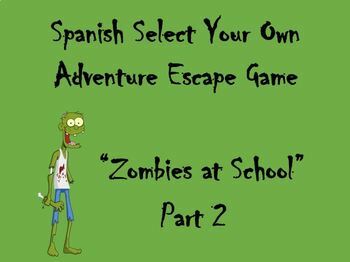 Just like part 1, most outcomes in this game lead to them encountering zombies and forces them to start over, however one path allows them to “save the day”. Along the way they will have to read through the Spanish story line and choose their own fate, in between decisions there are also a few google forms that ask them to write out the explanations to their decisions before moving forward in the game. This is a super engaging reading and writing exercise for upper level Spanish 3 or 4. I do not recommend this activity for lower level Spanish classes. Duration is 45-55 mins. **Game requires access to a computer or other tech device. This is ran on google sites with google forms.